NEW YORK (CelebrityAccess) — Hard rock legends Deep Purple have announced dates for a North American summer tour and European dates this fall. The announced US dates kick off on July 14th in Lewiston, NJ at Art Park Amphitheatre and conclude on August 15th in Indio, Ca at the Fantasy Springs Casino. Deep Purple will also be launching a European tour this fall, kicking things off in Lodz, Poland on October 25th at Atlas Arena and concluding the tour on December 3rd in London at the O2. In late August the group will make two European music festival appearances; the first in Arbon, Switzerland at the Summer Days Festival and the second at the Summer Nights festival in Singmaringen, Germany. The band has also previously revealed a spring tour of Mexico that will be launching on May 27th in Puebla at Centro Expositor and wrapping up on June 7th in Ciudad Juarez at Estadio Carta Blanca. 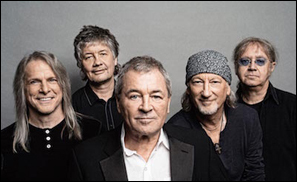 The current lineup of the band features vocalist Ian Gillan, bass player Roger Glover, drummer Ian Paice, guitarist Steve Morse and organ and keyboard player Don Airey.